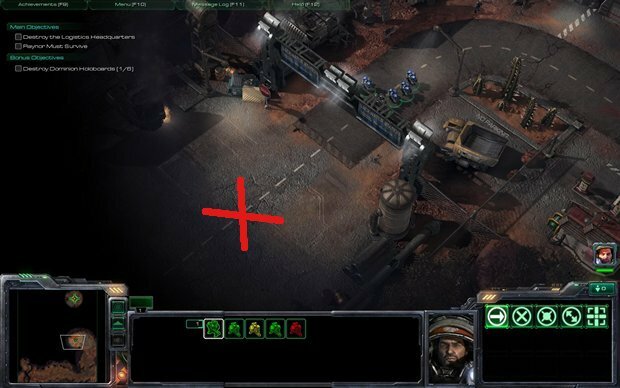 I’ll post some tips to help you beat the levels in StarCraft 2: Wings of Liberty here from time to time. Let’s start with the very first level “Liberation Day”. During that level, you’ll learn how to move your troops. There is little to say about this. If you advance, use “A(ttack)” and click somewhere you can see. This way, your troops will open fire as soon as they spot an enemy. Keep your troops centered on the street to avoid having one member “cut off” (i.e. out of range to shoot the opposition). This way, all your soldiers will be able to fire at once. If you can, right-click on single enemy soldiers to kill them more quickly. That will help to reduce damage but comes at a cost: There will be a small pause before your soldiers will start shooting the next target. So be ready to right-click the next target as soon as the previous one goes down. The most important part is the cut scene in the middle where new troops are deployed from orbit. This is not a video, it’s in game! So as soon as you see the enemy soldiers take cover in the central area, press “A(ttack)” and get your mouse into position. As soon as the pods land, click to get your troops moving. Timing is important here. You want to arrive there as soon as your fresh troops open fire to catch the opposition in a crossfire. If you arrive too early/late, you will take unnecessary damage. It helps to advance your troops as far as possible without triggering the attack. See the image for a good spot. Otherwise it will take too long for them to arrive. Another tip: If the street is too narrow, send your soldiers a little farther than necessary to open fire and then attack. This way, everyone in your army will be in range to shoot at the cost of a bit of additional damage in the first moments of battle. This entry was posted on Tuesday, August 24th, 2010 at 09:23 and is filed under Game. You can follow any responses to this entry through the RSS 2.0 feed. You can leave a response, or trackback from your own site.